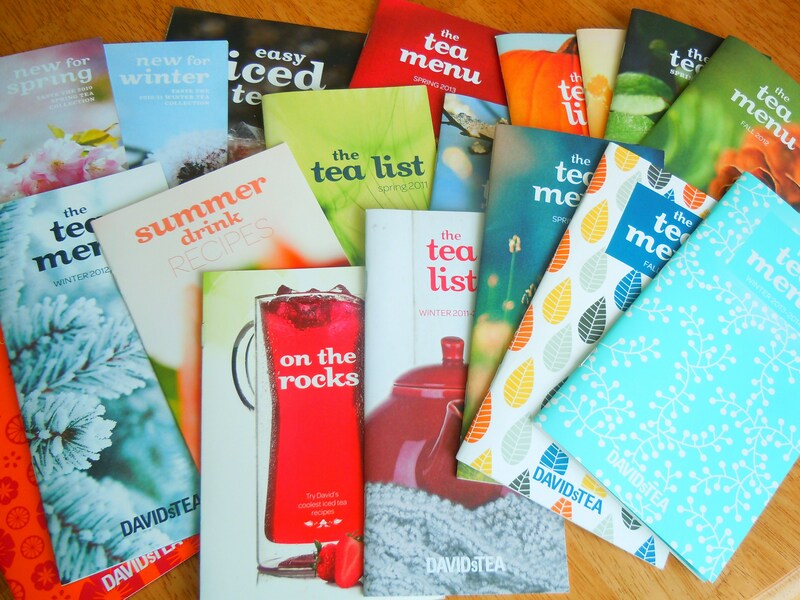 Yes, that’s right, I keep all my tea menus! In my world, every day is a day for tea. Most of the folks in my life start their day off with a cup of coffee but for me, I start mine off with the kettle whistling and a tea cup or tea mug raring to go. And with January being National Hot Tea Month, the weather being so cold and David’s Tea promoting their Cup of Warmth local hunger relief charity donation, there’s never been a better time to grab and enjoy a cup of warm and soothing sweet loose leaf tea while making a difference at the same time. 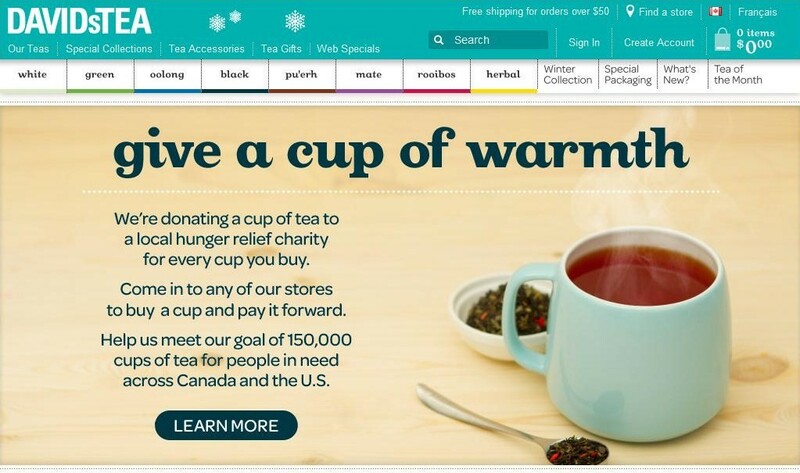 On January 15, David’s Tea began their Cup of Warmth promotion nationwide, even tapping into several cities across the border, donating the loose leaf tea equivalent for every single cup of tea purchased and every single social media share of the event to a local hunger relief charity and/or food bank in every province in the country and 4 cities in the US (Boston, Chicago, New York and San Francisco). For us here in Ontario, David’s Tea has linked hearts and arms with Second Harvest. Buy a cup, give a cup. It’s that simple. Their goal is to reach 150 000 cups by the end of January 28 so if you happen to be out and about and around a David’s Tea this weekend, grab a cup of your favourite flavour or try a new one to help contribute to the rising total! 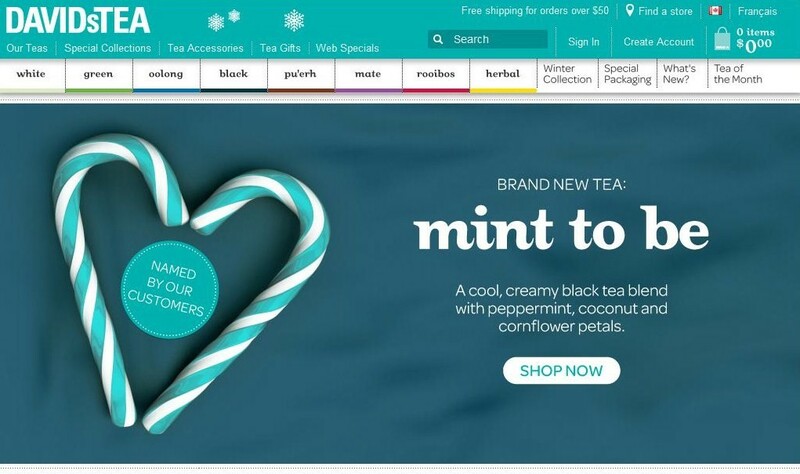 And if you can’t get out to a shop, you can still get involved and help out by tweeting about it on Twitter @DAVIDsTEA and sharing it through Facebook. Goodness knows I’ve done my share of tea drinking over the last week, trying out some new flavours and ticking them off in my current David’s Tea tea menu! If you need some recommendations, here are my top David’s Tea picks (in no particular order!) that will warm you up and keep you toasty! And as for seasonal honourable mentions, try the Choconut Oolong, Coffee Cake and White Chocolate Frost from their Winter collection, they’re terrific! Out of all the teas I’ve tried so far from David’s Tea’s permanent menu, these are my absolute favourites and I’m always finding myself wanting to default to the list of 8 teas up top. There are so many others I need and want to try though (including Kiwi’s Big Adventure, Ceylon Star, Jessie’s Tea, Orange Blossom and their latest addition, Mint to Be!) so I have no doubt that list of 8 will grow to 10 or even 12. Honestly, I look at my growing tea collection in my room and it makes me happy (and leaves my brother in a state of awe. After walking into my room to pick out a tea to drink one morning, he stopped dead in his tracks and said, “oh my goodness, it’s like walking into a David’s Tea in my own house!”). So much of my life now revolves around it (trying out recipes that would go great with a tea party menu, eating and drinking my way through afternoon tea spots in the city with my best friend and boyfriend, reading tea literature, learning about tea history, the list goes on) and it’s remarkable just how much joy it’s brought me. Knowing this makes paying it forward, even if it’s only one cup of tea at a time, that much more meaningful. I swear I’m not a nut. Or a horrible girlfriend for that matter. Seeing how I am posting photos of half a dozen sitting daintily in said pretty yellow box though (from left to right: Cafe au Lait, Mont Blanc (chestnut sandwiched between vanilla and chocolate), Earl Grey, Chocolate Hazelnut and Raspberry. 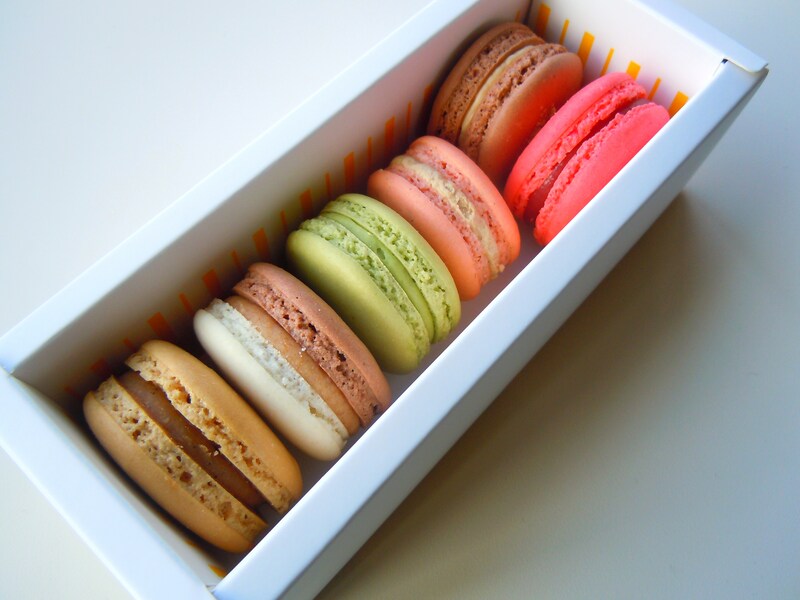 Macarons are $2.25 each or $13.50, tax inclusive, for a gift box of 6), you can tell I exercised some self-restraint. And I am proud to report I did not eat them all in the shop. 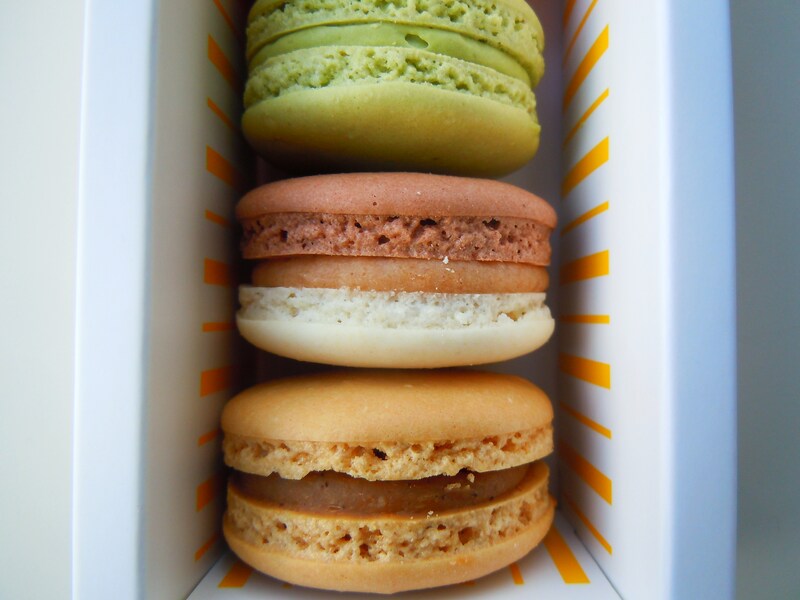 I only ate one inside Butter Avenue (the creamy, fruity red Raspberry, which has now become one of my favourites right up there with the Cafe au Lait and Matcha Chestnut flavours I previously posted about HERE) and I even saved a few to bring home for my family. 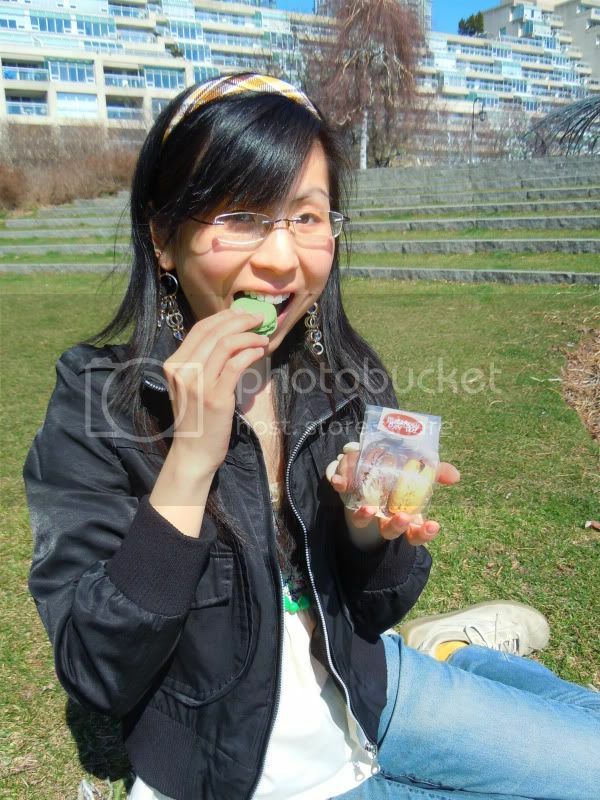 They enjoy macarons more than they enjoy cupcakes. What can I say? I’m a giver. Let’s be real though. 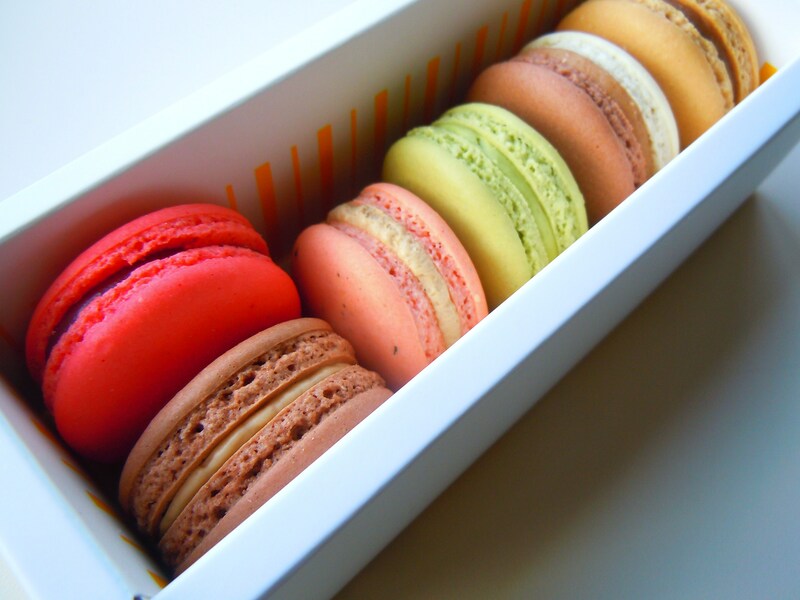 The second those macarons were gone I mentally cursed myself for not buying more. I should have known better! Sigh. 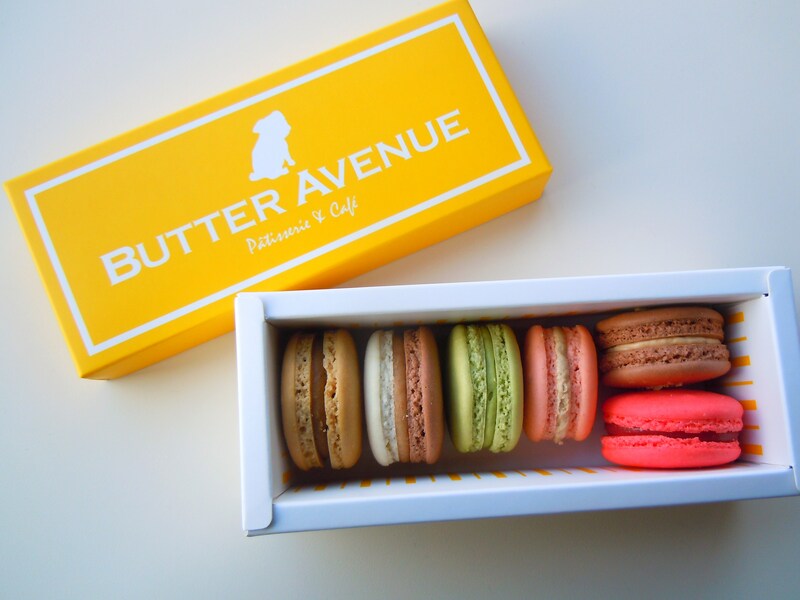 However, I do have one very sweet and compelling reason to make a return visit next month: Valentine’s Day is right around the corner and once a year, just for the occasion, Butter Avenue makes their famous heart-shaped macarons! 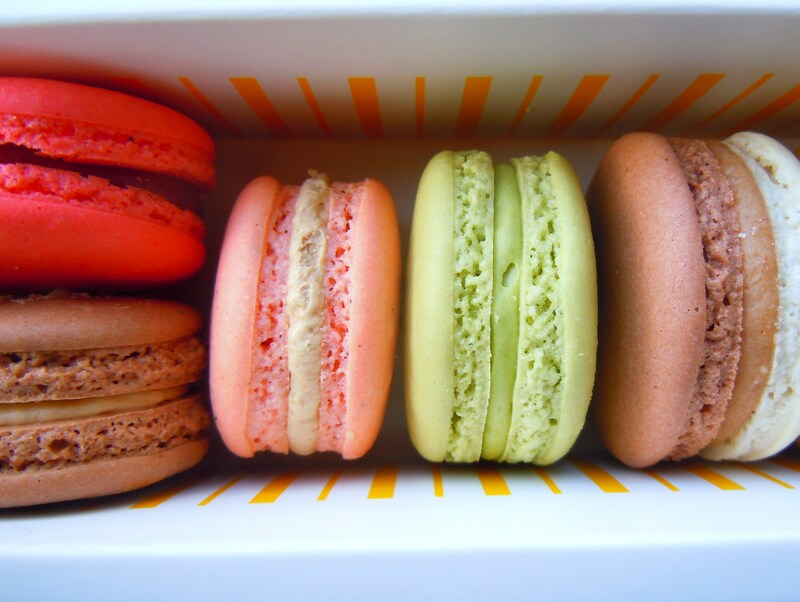 I thought heart-shaped macarons were only fancy pants things created in the kitchens of ambitious and talented pastry chefs or in patisseries in the heart of Paris (or in our day and age, on the pinboards on Pinterest), not something I could actually get my hands on in my own city. 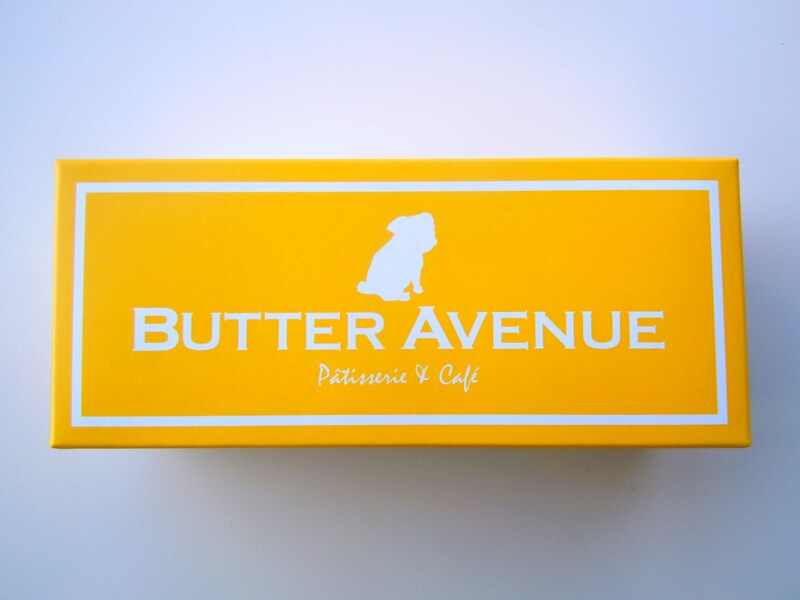 To my knowledge, Butter Avenue is the only place in the city that makes them and I have yet to try them so I think this Valentine’s Day will be the day! 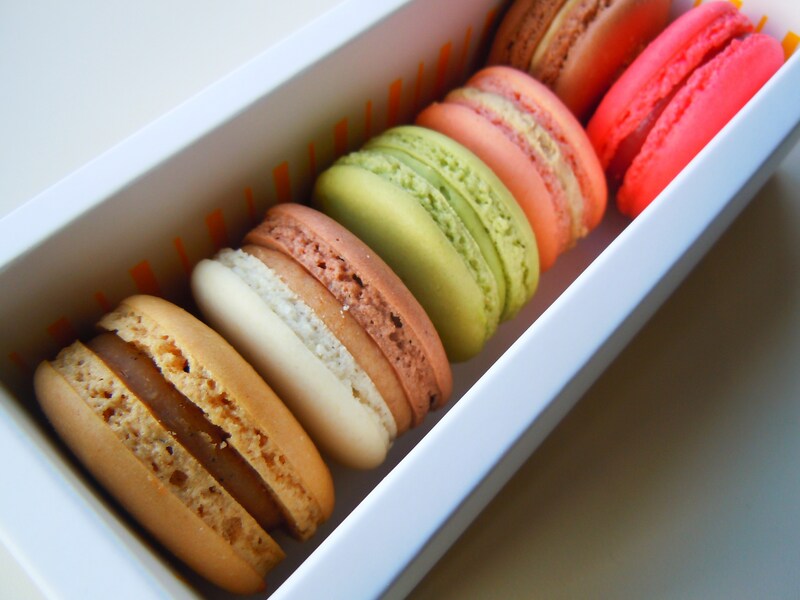 And maybe, just maybe, I can soothe that macaron craving still raging in that little tummy of mine, even if it’s just for a little while. 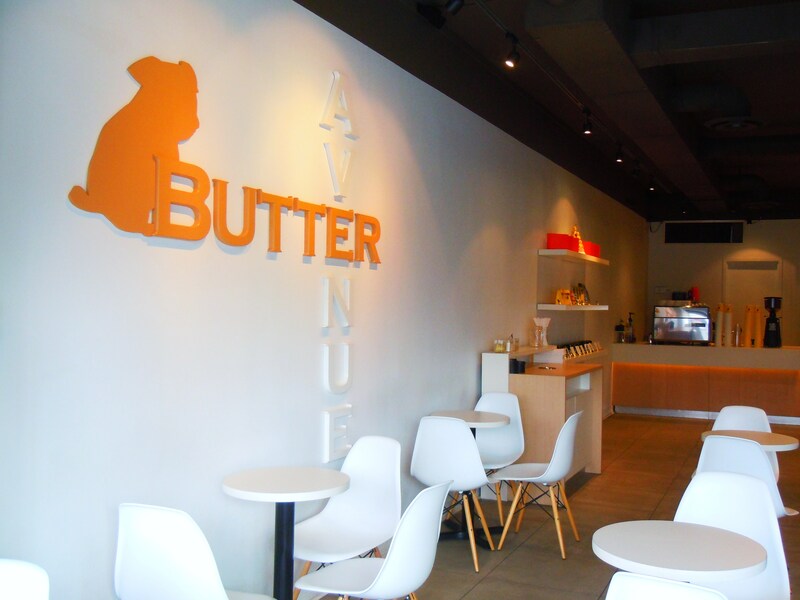 Butter Avenue Patisserie & Cafe is located at 3467 Yonge Street, at the corner of Yonge St. and Yonge Blvd. (a little confusing, I know!) north of Teddington Park Ave., between the major subway stations of York Mills and Lawrence. They are open 6 days a week (closed on Monday): 11am-8pm Tuesday-Thursday, 11am-10pm Friday-Saturday, and 11am-7pm on Sundays. 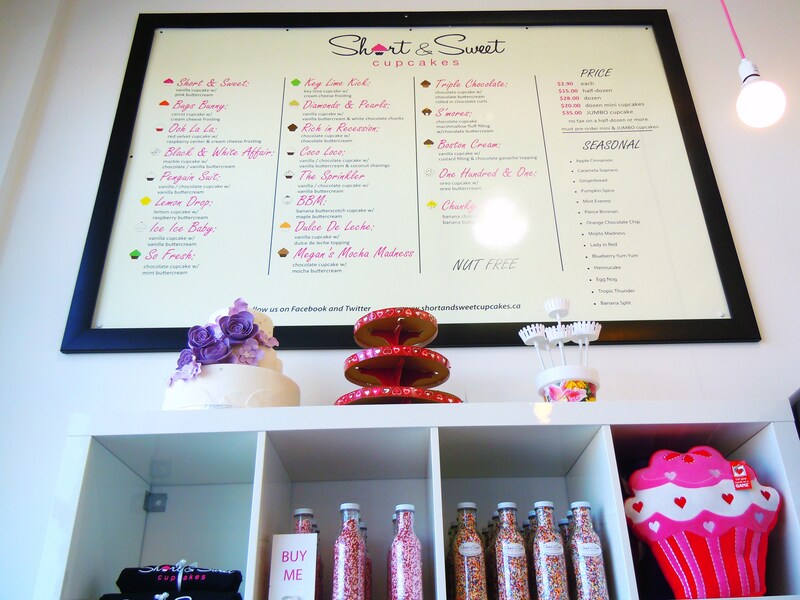 Like a Cupcake Lounge – A Photo Spotlight on Short & Sweet Cupcakes’ Vaughan Location & Megan’s Mocha Madness! 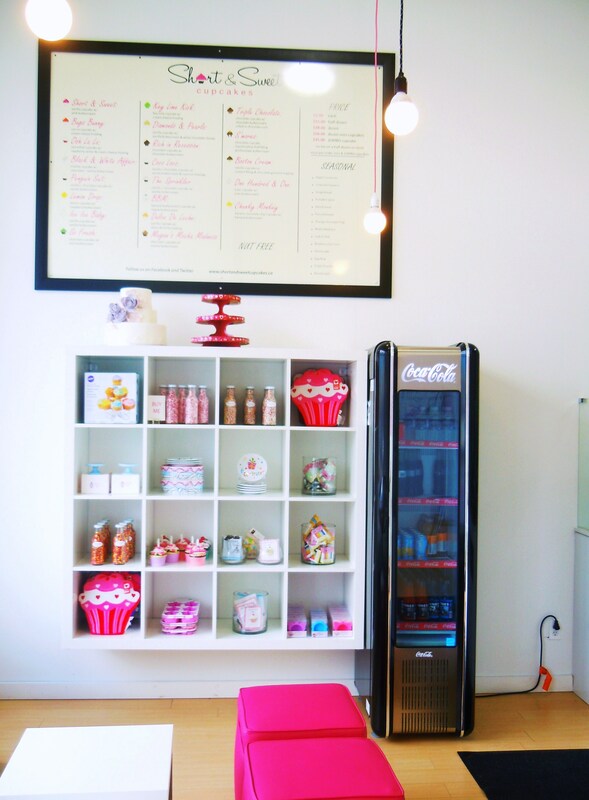 While working on my big Cupcake Chronicles feature page today behind the scenes, I realized I never shared my photos of Short & Sweet Cupcakes’ Vaughan location or my photos of their amazingly delicious Megan’s Mocha Madness cupcake with you guys after all this time! 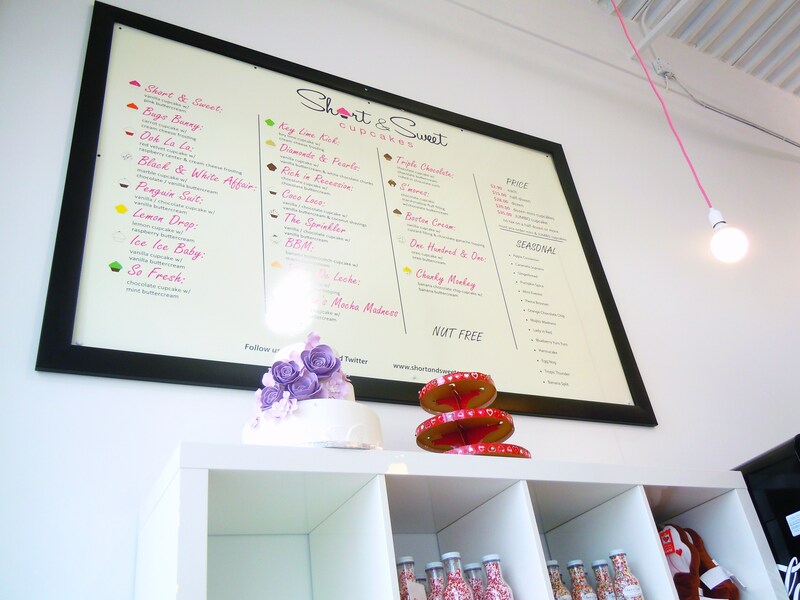 I know this post is a little on the late side given how it’s been about a year since Short & Sweet opened their second location, but Ate by Ate just wouldn’t be complete without a post showcasing their York Region arm in all it’s beautiful cupcake lounge-like glory! 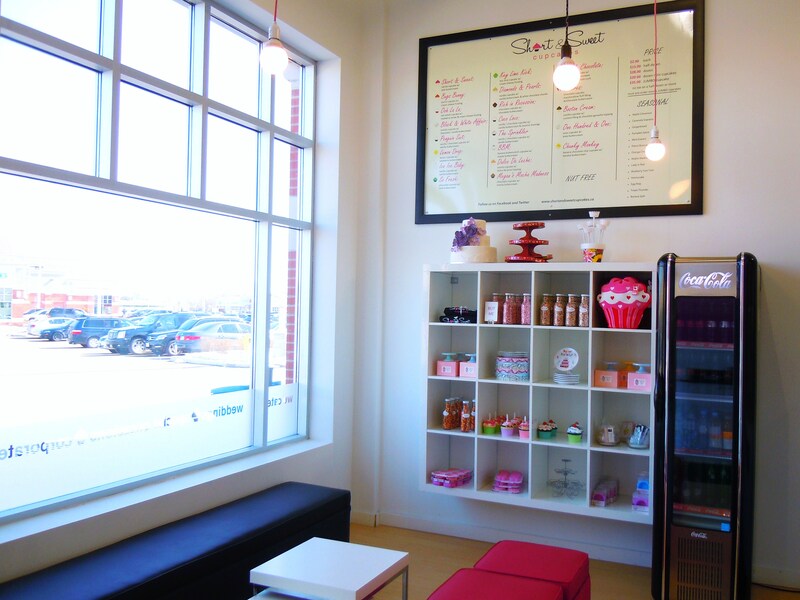 Located at Major Mackenzie Drive West and Dufferin St. within the Eagles Landing complex, the shop boasts a spacious, airy seating area near the back as well as a lovely hot pink seating lounge right by the front window, perfect for enjoying your cupcakes with friends! 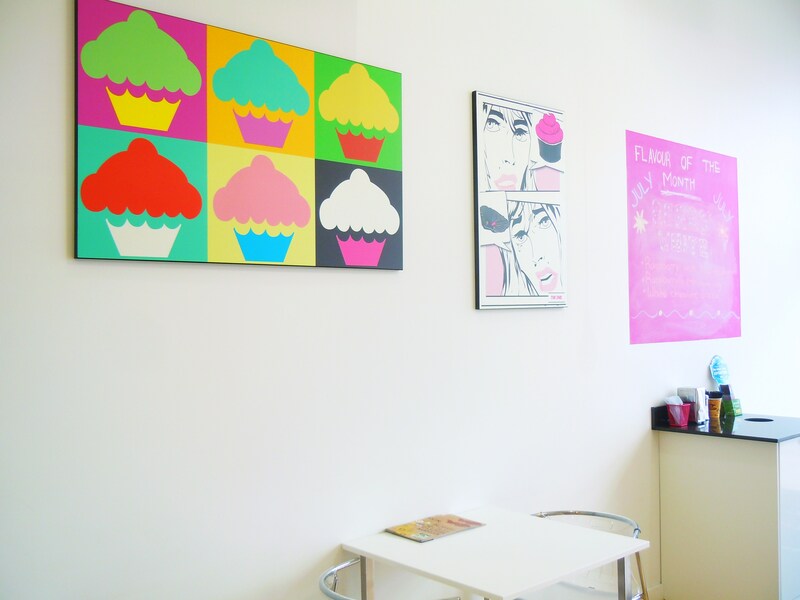 They have colourful cupcake artwork on the walls, giftware to purchase up at the front and a big display case for their many flavours of cupcakes. It’s a fun and fresh space and I really enjoy taking photos of the cupcakes here because the big window lets a lot of nice natural light in. 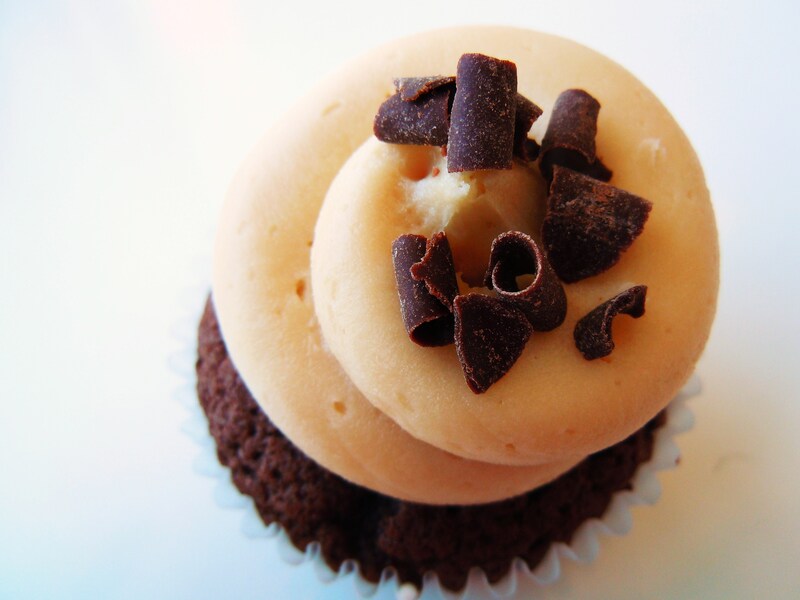 And speaking of light, today’s photo spotlight is for one of my Top 5 faves from Short & Sweet, the Megan’s Mocha Madness which is a Friday-only specialty. I have waited so long to have this. I have had so many Fridays pass me by without this cupcake in my life because of either work or school or just not being in the area so you can imagine my squealing happiness over this morsel of decadence when I finally got around to having it. 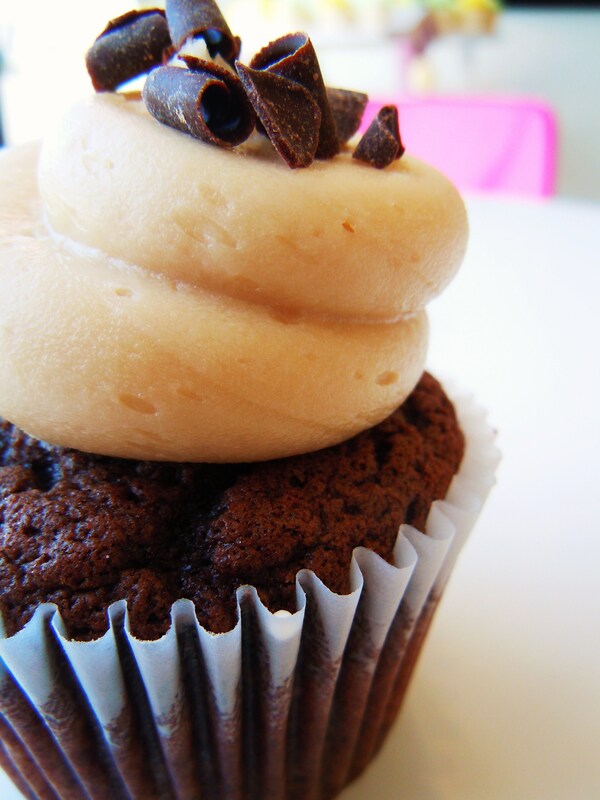 It’s a chocolate cupcake with mocha coffee frosting and chocolate curls on top. The frosting is one of the most delicious frostings I’ve ever had and this is coming from a girl who doesn’t even drink or like coffee! It’s one of their best because the chocolate cake is fudgy and moist and the frosting is extremely flavourful and creamy without being overpowering with that bitter coffee aftertaste or too sweet and lacking in depth. I think they hit the nail on the head with this one and I wish so much that this was part of their every day roster as opposed to just being available on Fridays because this is a flavour that I could go for time and time again. Even though I didn’t take these particular photos at their Vaughan location (there’s a reason for that, read on), I wanted to share them anyway since it’s been so long since my last Short & Sweet post. 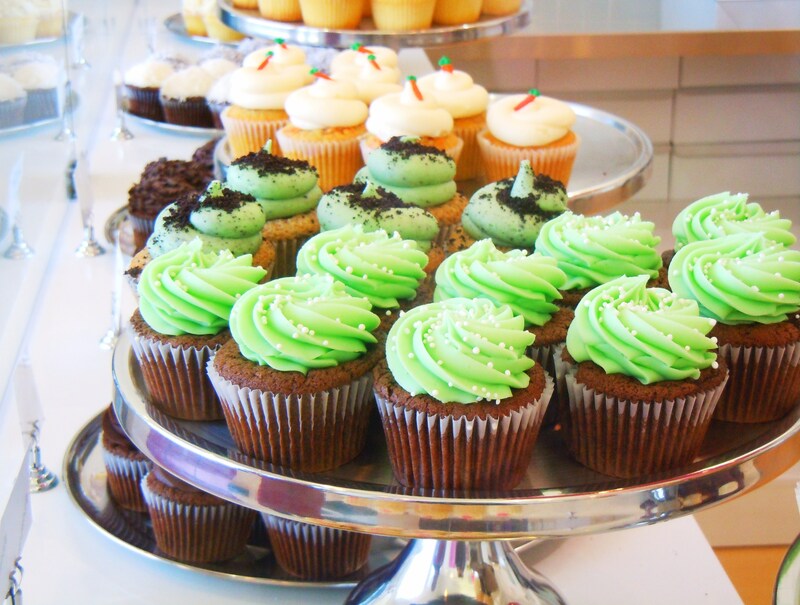 So, you’re probably thinking, “well, that’s terrific that your favourite cupcake shop opened a location in York Region where you live!” You’d think that. But after careful calculations and an experiment with my best friend, I have discovered that it is actually easier for me to get to their Avenue Road shop instead of the one on Major Mackenize! At least during the weekends. It’s easy-peasy during the week, but the timing doesn’t jive with a work schedule and boy is it ever awkward on a Saturday. Unless there’s a car involved or a random weekday I have off, getting here on Saturday would require taking 2 buses (which isn’t the most practical because there’s some doubling back involved) and then walking for another half hour and then finally walking on the side of the road to get into the complex because no sidewalk exists. But all of this mumbo-jumbo? Because the most straight-forward transit route to the shop doesn’t run on weekends. Sigh. That’s York Region transit for you. Regardless of the confusing transit issue, I love the Vaughan location for its larger space and I can definitely appreciate the fact that both Ginza Sushi and Yummy Market are both a hop, skip, and jump away! I’ve been working really hard on the Cupcake Chronicles since Ate by Ate started and it’s been a joy profiling so many shops and tasting all the variety the city has to offer. I’m hoping to fill in some more holes this year so that we can have photo spotlights on Short & Sweet’s Blueberry Yum Yum in May and Tropic Thunder in June at the very least. Look out for Valentine’s Day cupcake posts in the coming weeks! 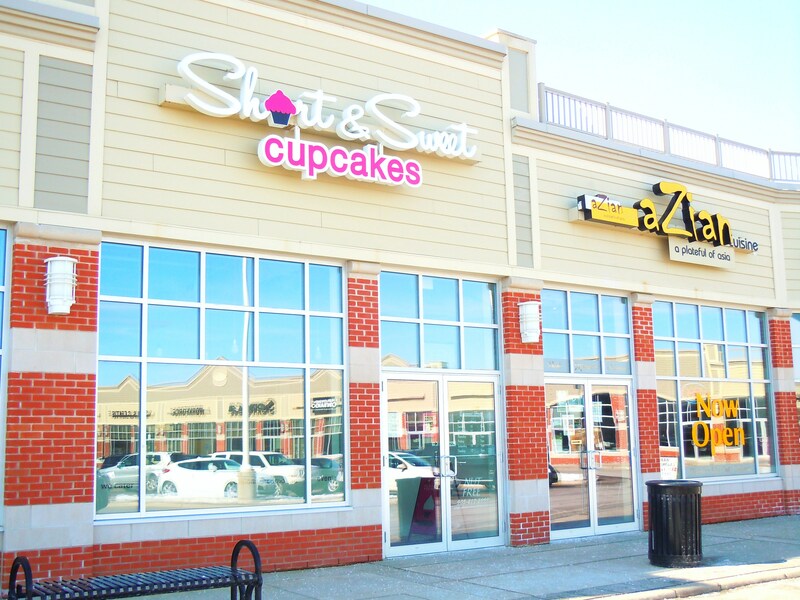 Short & Sweet Cupcakes serves two locations in the GTA: 1945 Avenue Road (south of Wilson Ave.) in Toronto; open Monday to Saturday from 11am-6pm, closed on Sundays || 1480 Major Mackenzie Drive West (at the corner of Dufferin St.) in Maple, Vaughan; open Monday to Saturday from 12pm-7pm, closed on Sundays. 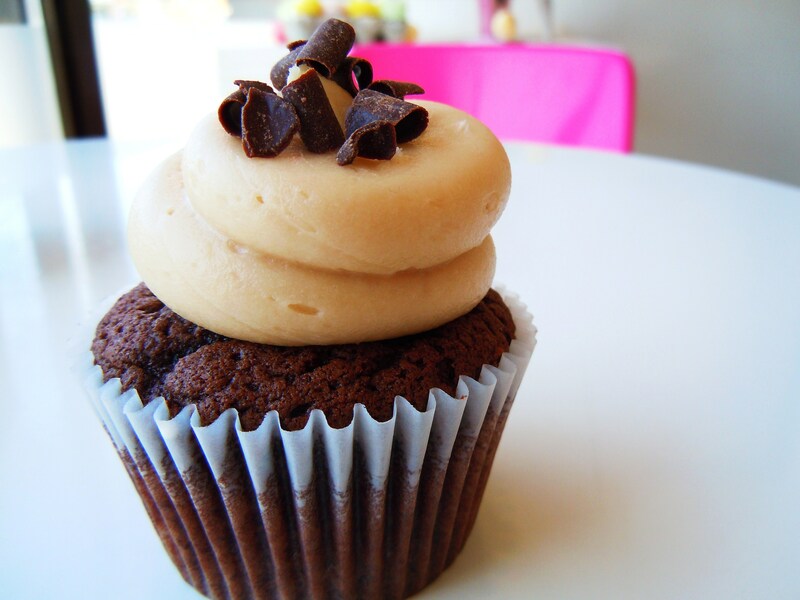 You can also find their cupcakes at some Aroma Espresso Bar locations! 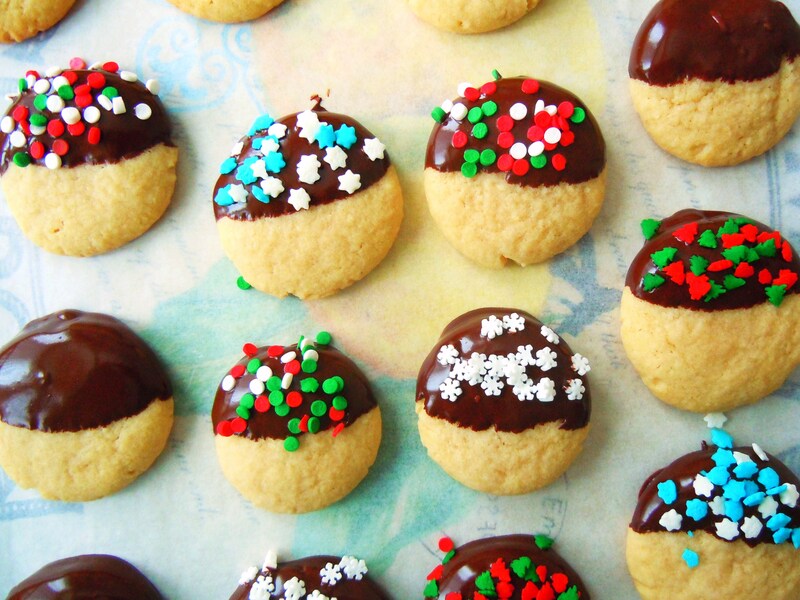 Almonds and chocolate and sprinkles, oh my! I had myself a fun and relaxing cookie baking and decorating party recently (if you consider running back and forth from the oven to the kitchen table with 4 baking sheets of cookies relaxing! 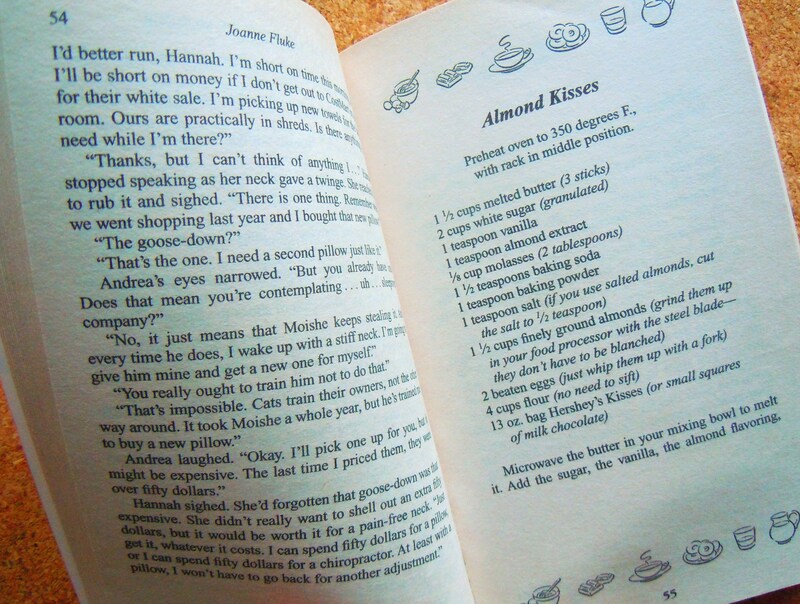 ), testing out a recipe for Almond Kisses from Joanne Fluke’s Lemon Meringue Pie Murder from the Hannah Swensen foodie murder mystery series (if you don’t know about these books and how much I love this series, you need to jump on the bandwagon, PRONTO!). I love baking out of these books so much and it had been awhile since the last time I tried out something new from one of them so I jumped on the opportunity one Saturday morning to make these amazing almond cookies. The original recipe uses Hershey’s Kisses for the cookie middles but unfortunately, I didn’t have any of my favourite cookies ‘n cream ones or the yummy milk and white chocolate swirly ones so I settled on testing out the base almond cookie recipe first and jazzing up a batch with chocolate chips mixed in and another batch dipped in melted chocolate and sprinkled with sprinkles! 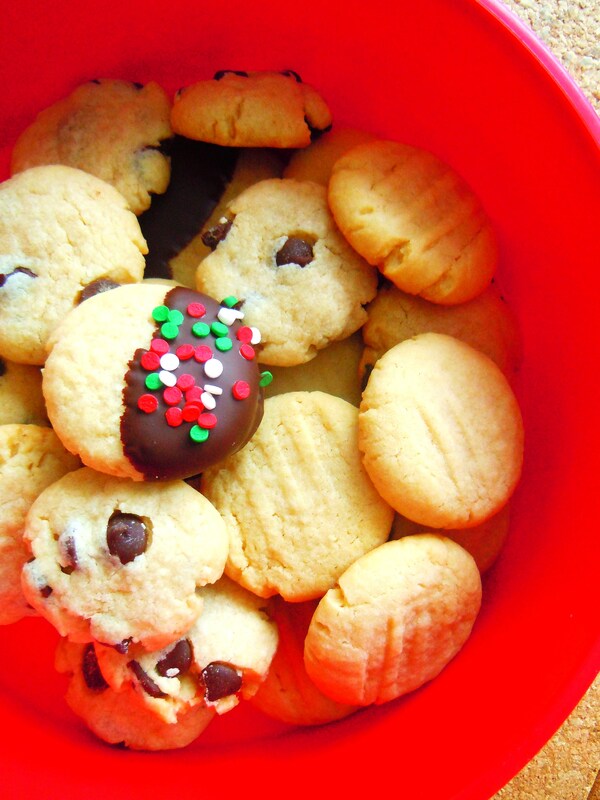 I had the best time making these cookies and they turned out perfect! And oh my goodness they taste fantastically delicious. Trust me when I say that they test the most delicious straight out of the oven. I know you have to let them cool to dip them in chocolate if you want to follow my lead, but I really just mean within the first day or so. They taste totally fine even a week after (providing you store them in a sealed container of course), but to really get the full food orgasmic effect, you need to taste them soon after they’re baked because they are just divine. Like marzipan on cloud nine. This is the type of recipe that can spawn 10 others simply because it’s so simple and versatile. 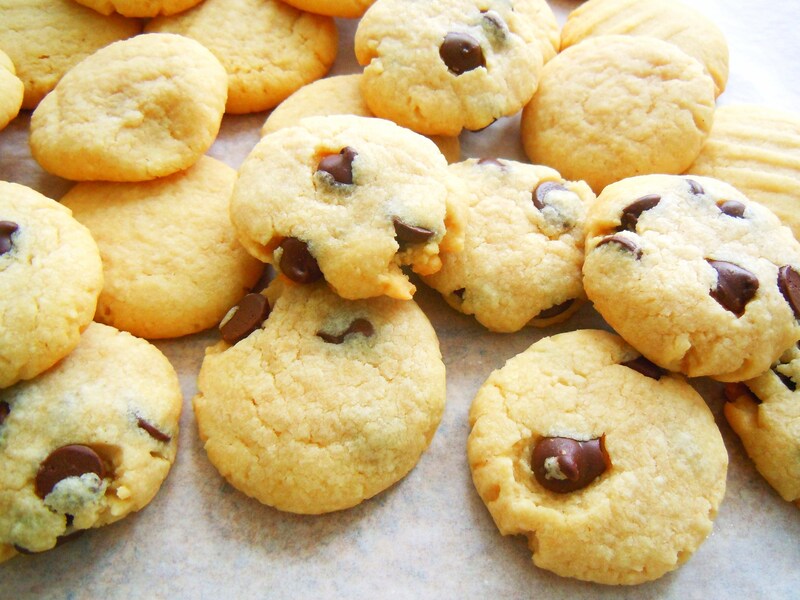 You can mix in chocolate chips (regular, white, butterscotch, whatever you like! 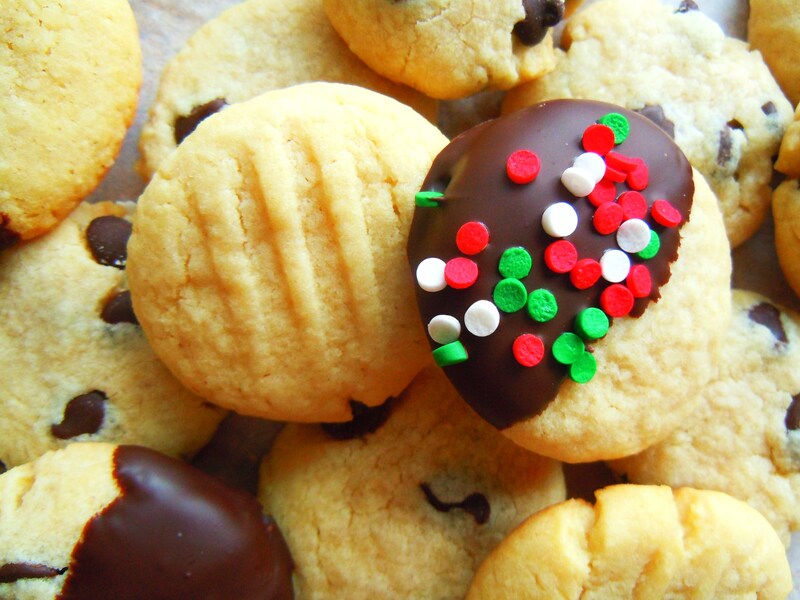 ), small sprinkles and shredded coconut, dip them in melted chocolate, or glaze them. Or just leave them plain. I was so offended. Hmph. IT’S NOT MY FAULT THEY’RE SO YUMMY THEY DISAPPEAR LIKE CRAZY! This is a must-try recipe, everyone, enjoy! your choice of add-in should you wish to use it! Heat oven to 350°F (*Deb’s Note: because my oven runs hot, I lowered mine to 325°F). Melt butter in microwave in mixing bowl. Add sugars, vanilla extract and almond extract (Deb’s Note: if you are not using brown sugar and instead using molasses (see note in ingredient list), add the molasses after the adding the almond extract); mix with electric mixer until blended. Add baking soda, baking powder and salt; mix well. Add ground almonds; mix well. 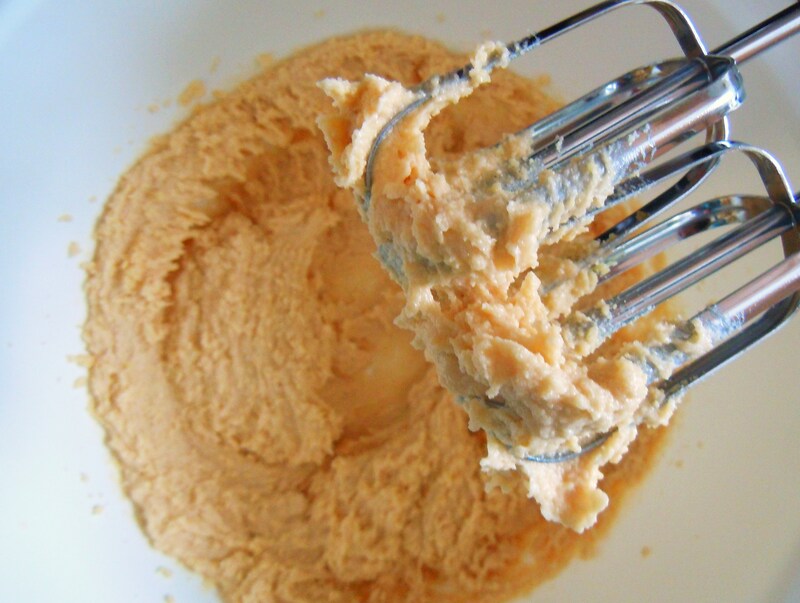 Chill cookie dough in refrigerator for 1 hour. Roll dough into small, walnut-sized balls. Place on parchment-lined baking sheets, 15 dough balls to a sheet. Flatten dough balls slightly using the palm of your hand. Use the tines on a fork to make an indentation if you wish to jazz up the tops. Bake 8 to 10 minutes (Deb’s Note: I baked mine for 8 minutes). Cool on baking sheets for several minutes before removing to wire rack to cool completely. 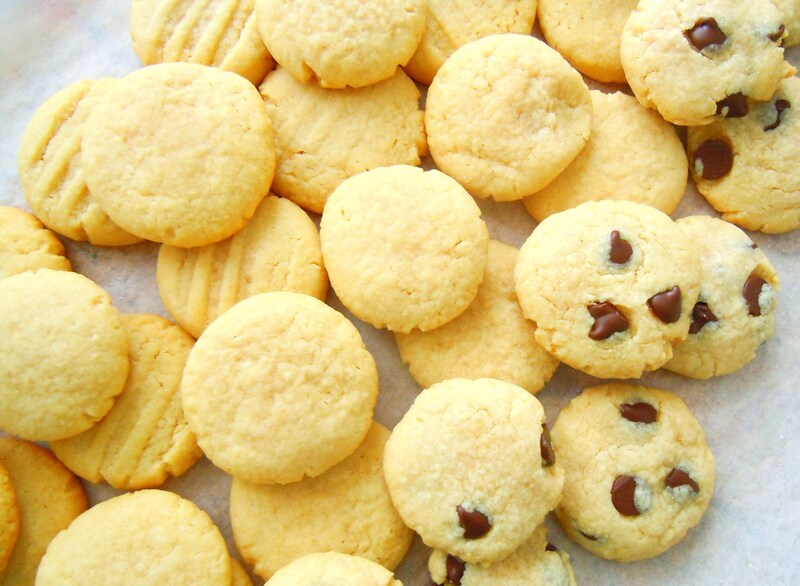 Proceed to stuff your face with delicious fresh baked cookies. Go the extra step and decorate using melted chocolate and sprinkles – like me! Rinse and repeat. 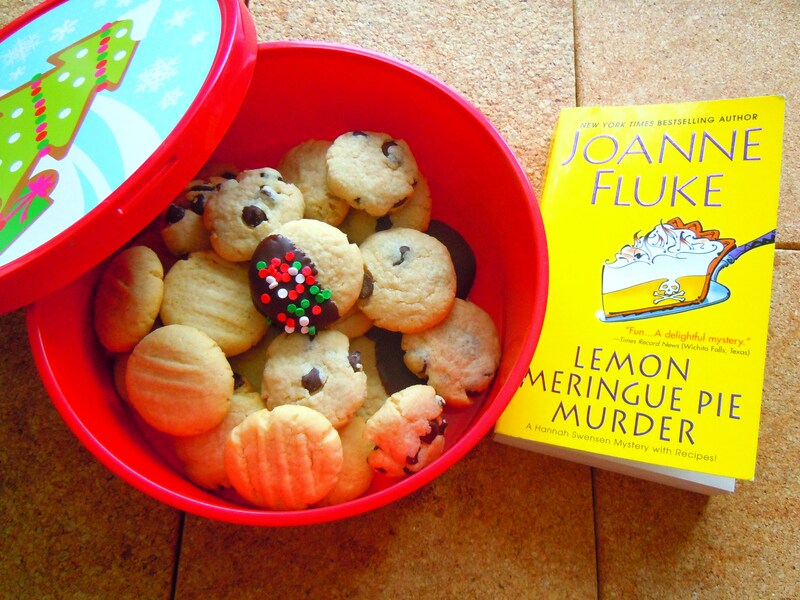 Recipe adapted from Joanne Fluke’s Lemon Meringue Pie Murder. New York: Kensington Publishing Corporation, 2003. Photographs taken by me. 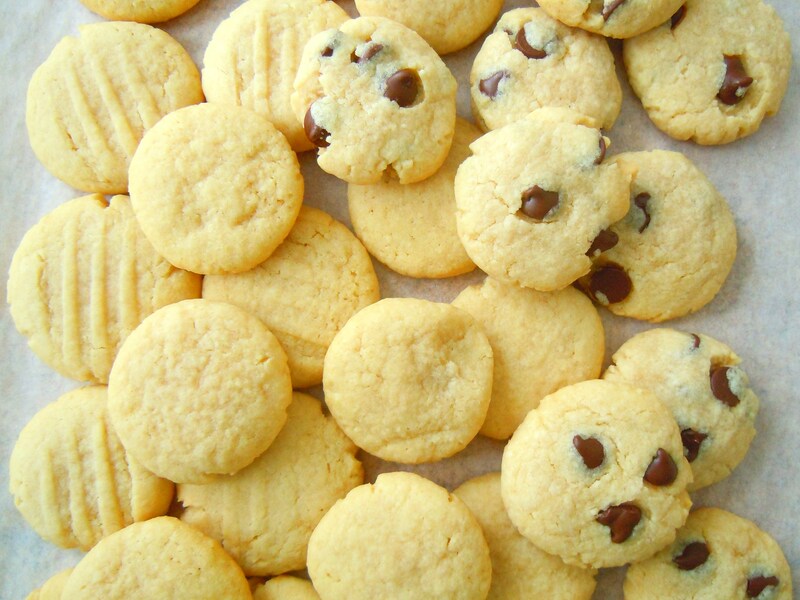 The recipe can be found on page 55. 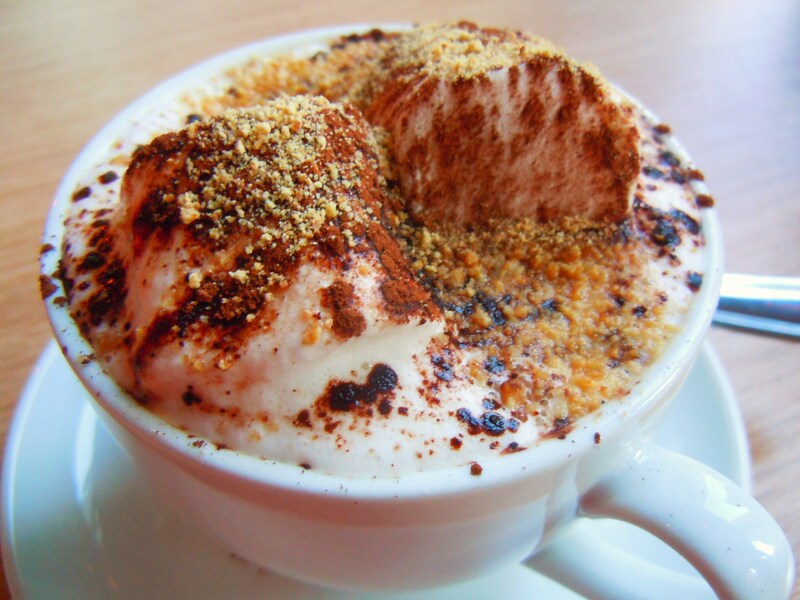 The Hot Chocolate Series – Want “S’more”? 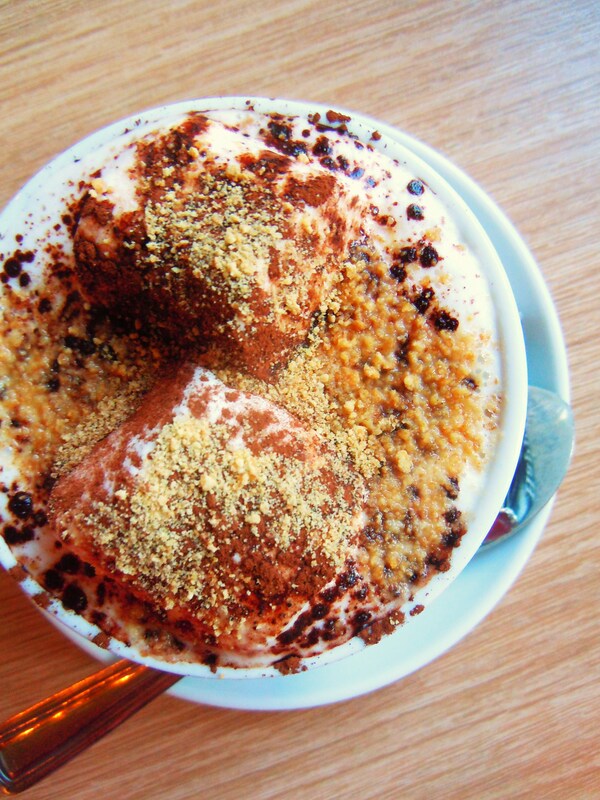 The Fun & Decadent S’mores Hot Chocolate at Aroma Espresso Bar! As well, I’ve been so focused and preoccupied with tea for the past few months I haven’t given hot chocolate the love it deserves (that and apple cider. But that’s a whole ‘nother can of worms.) There are so many delicious varieties just waiting to be slurped and savoured from cafes and restaurants all across the city but I’ll sheepishly admit it’s been hard steering my attention towards other beverages when all I can think of is what type of tea I want to spoon into my mesh ball when I wake up in the morning! 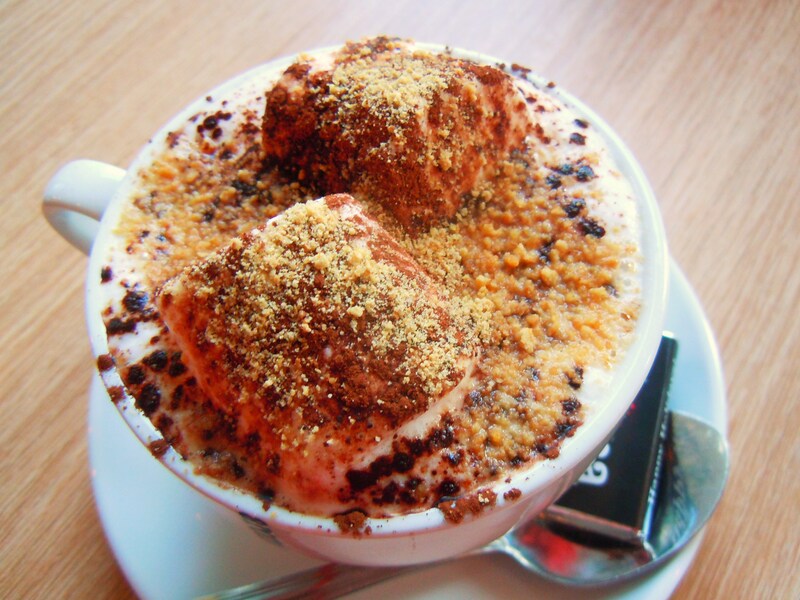 There’s no reason why I can’t enjoy both though, especially with all the fun flavours and toppings places are experimenting with, like the gorgeous fluffy, chocolately, marshmallowy masterpiece at Aroma Espresso Bar! New to the drink menu this winter, Aroma Espresso Bar’s S’mores Hot Chocolate ($4.80 medium) is everything you could want in a hot chocolate drink that screams, “I’m so fab I could be your bff at a posh ski lodge!” It really does have all the bells and whistles: chunks of Aroma’s creamy milk chocolate melted in steamed milk and melted marshmallows, topped with cocoa, graham cracker crumbs and giant pillow-soft marshmallows! It is a thing of beauty and it tastes delicious. 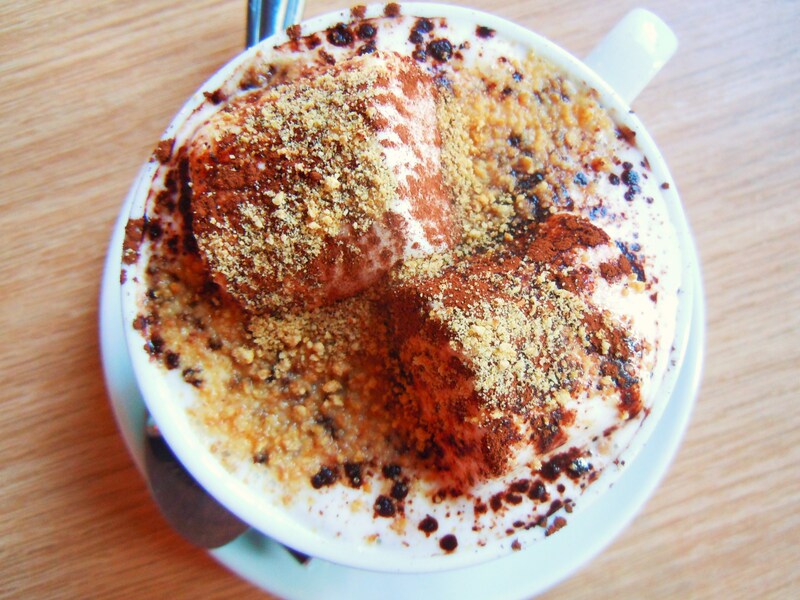 The drink is creamy and frothy on top and rich and decadent as you get closer to the bottom where all the melted chocolate has been mixed in. 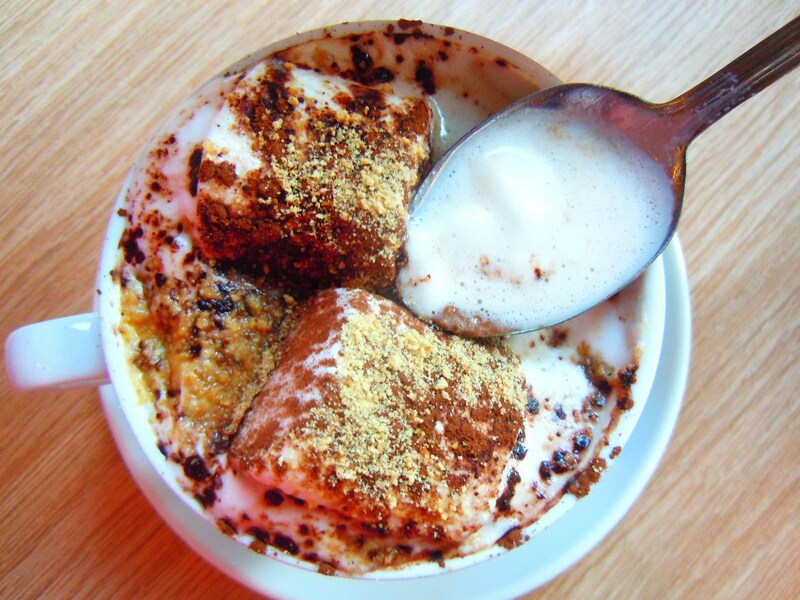 The giant marshmallows are super soft and the graham cracker crumbs totally elevate the drink, living up to its s’mores name. And surprisingly enough, it’s not a sugar bomb! I mean, it’s sweet and everything in it and on it is sweet but the sweetness isn’t overwhelming. It’s fun and dessert-like without being over the top flavour-wise. I’m hoping to get my hands (and tastebuds) on some mint hot chocolate and others this winter (as well as the hot chocolate at Fresh which I’ve tried but never took posted photos of because they didn’t look nice) so we’ll see how the hunt goes! Cheers and stay warm, everyone! 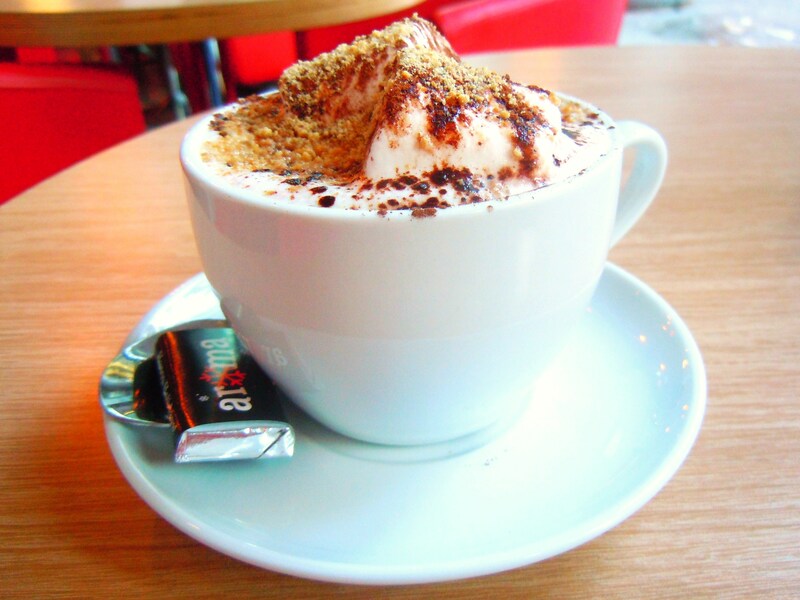 Aroma Espresso Bar is an Israeli espresso and coffee chain with over 100 locations worldwide. There are numerous branches in and around Toronto, with shops in Thornhill and Vaughan. Click here to view the list of Toronto and GTA locations. 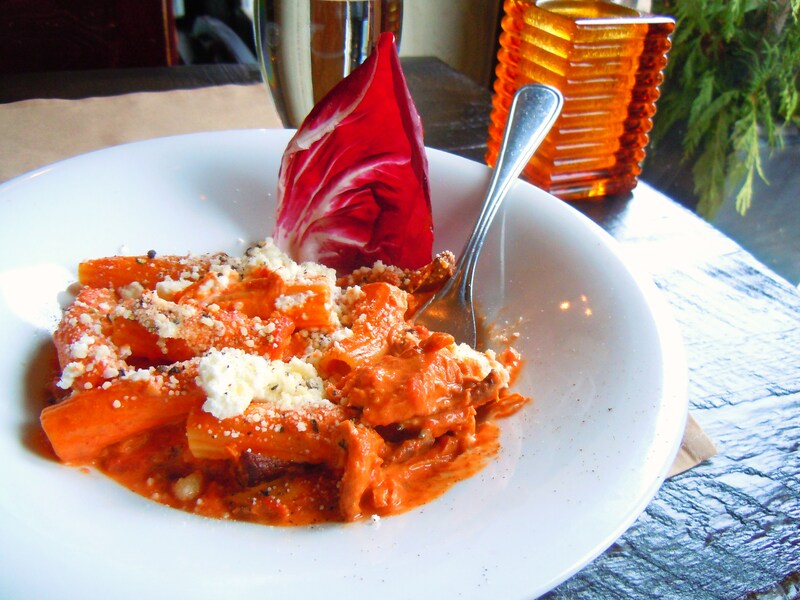 The day I enjoyed this hot and delicious, soul-soothing dish of pasta at La Vecchia was a day of kerfluffles of epic proportions: it was the Monday after the ice storm. 24 hours after the city was cloaked in a sea of white and frozen water, knocked out of power left, right and centre and 2 days before Christmas. And there I was taking 2 buses and the subway into town at the crack of dawn before daylight had even peeked out from the pitch-black sky. I know. I can hear the shrill “are you crazy? !” shrieks shouting at me in the distance. 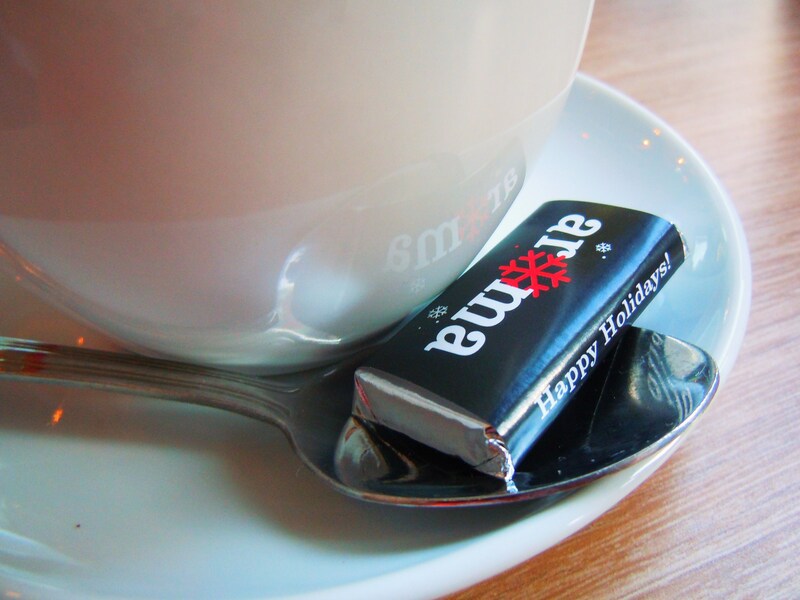 But having a weekday off before Christmas was hard to come by and I just wanted to go out and do some blog work. Beyond frustrated at the holidays being turned upside-down in more ways than one, I threw caution to the wind and headed out anyway. I knew it was going to be messy. But I did it anyway because I was fortunate enough to still have power in my home and able to exit my house and street for some fresh air so it just didn’t make any sense to waste a day if I wasn’t physically homebound, especially since there were specific things I wanted to accomplish on that particular Monday. So did I end up doing exactly what I set out to do? Not exactly! The power outage in many pockets of town definitely threw a wrench into the first part of my agenda (I bused northbound on Avenue Road, gaped at the wreckage and ghostliness out the window, mentally scrapped my plan and just stayed on the bus as it doubled back around at the end of the route!) 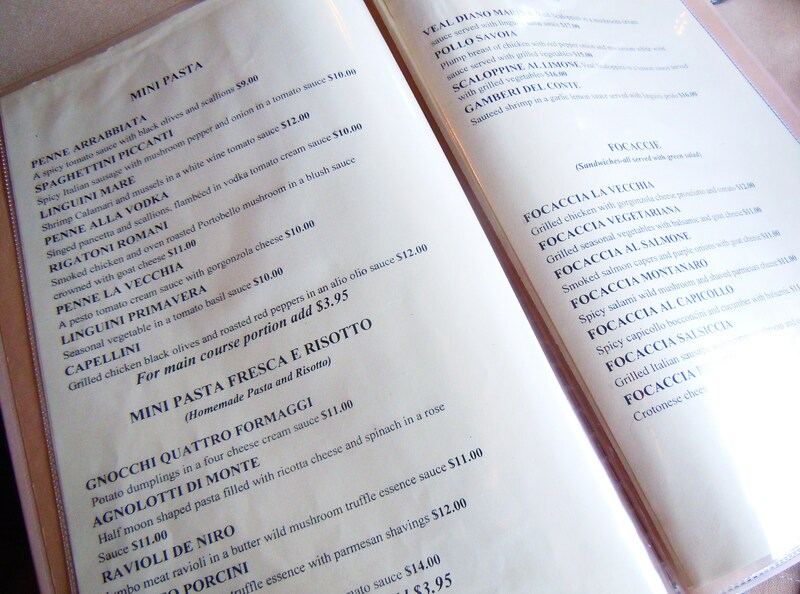 so I shrugged it off and decided to sit down to lunch a little earlier at one of my favourite restaurants in the Yonge & Eglinton area, La Vecchia! I enjoyed weekend brunch there so much during my first visit last March. I promised myself I would go back for their salads, sandwiches, mains, pastas and of course, more weekend brunch and while it took awhile I finally made my way back and had a fabulous lunch to boot. I haven’t done pasta justice on Ate by Ate so going to La Vecchia served two purposes: to get some scrumptious pasta in my belly and on the blog and to warm up with some really fantastic comfort food. With snow and ice surrounding you from all sides, nothing else would do. La Vecchia’s lunch menu offers 8 different pasta dishes ($9 to $12) including penne in spicy tomato sauce with olives and scallions, linguini with shrimp, mussels and calamari, spaghettini with Italian sausage, mushrooms, peppers and onions and capellini with grilled chicken, olives and roasted red peppers. 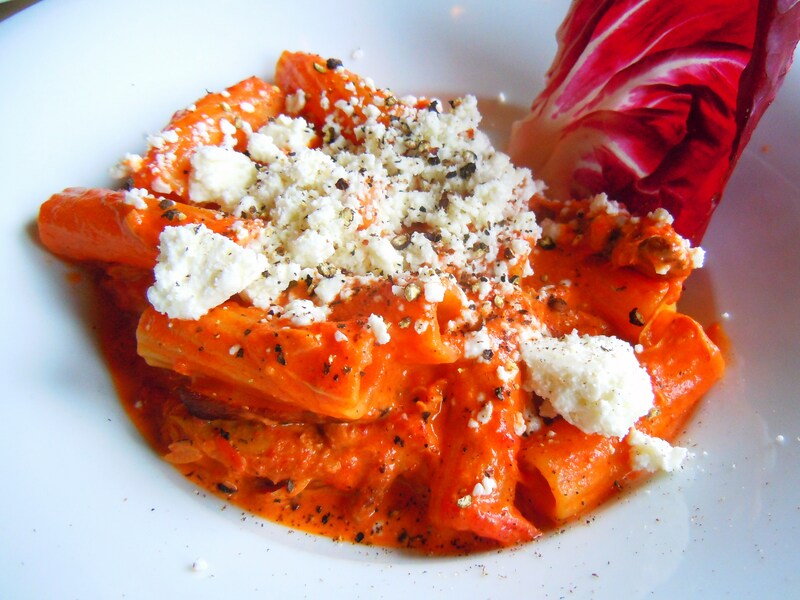 After seeing my boyfriend have their amazing Rigatoni Romani during our first visit though, I knew without a doubt THAT was the dish I needed to have. 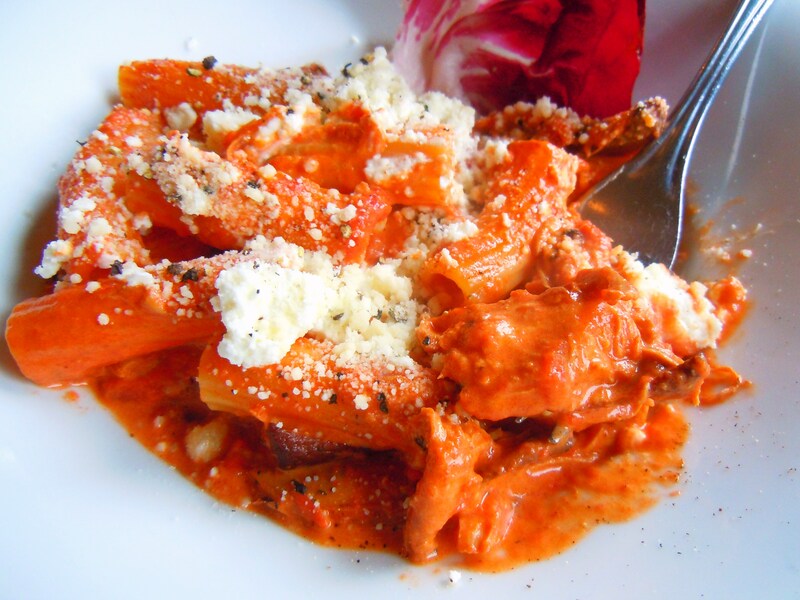 The Rigatoni Romani ($11) is served smothered in hot and creamy blush sauce (light cream tomato sauce) with smoked chicken, portobello mushrooms and lots of creamy, tangy goat cheese crumbles on top. A bright crunchy leaf of radicchio adorned my heart-warming dish and my server graciously spooned some Parmesan cheese and cracked some fresh black pepper over top to complete the mouthwatering masterpiece. 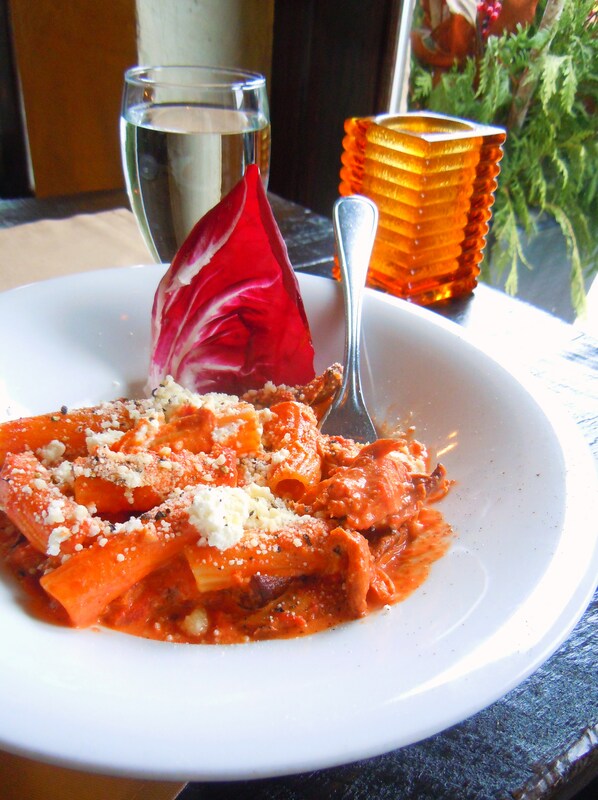 I admit, rigatoni wouldn’t normally be my first choice off the bat because long pasta noodles are the way to my pasta-loving heart. My 3 favourite pastas are pappardelle, linguini and spaghetti. However, that certainly doesn’t mean I don’t love all the others! I simply don’t have them as often. After this meal though, I thought to myself, “girl, you need to have more rigatoni in your life!” Rigatoni is lovely for so many reasons. The ridges and tubes catch every ounce of yummy sauce and its cylindrical shape is just plain fun. It reminds me of childhood and shapes and all that fun stuff. 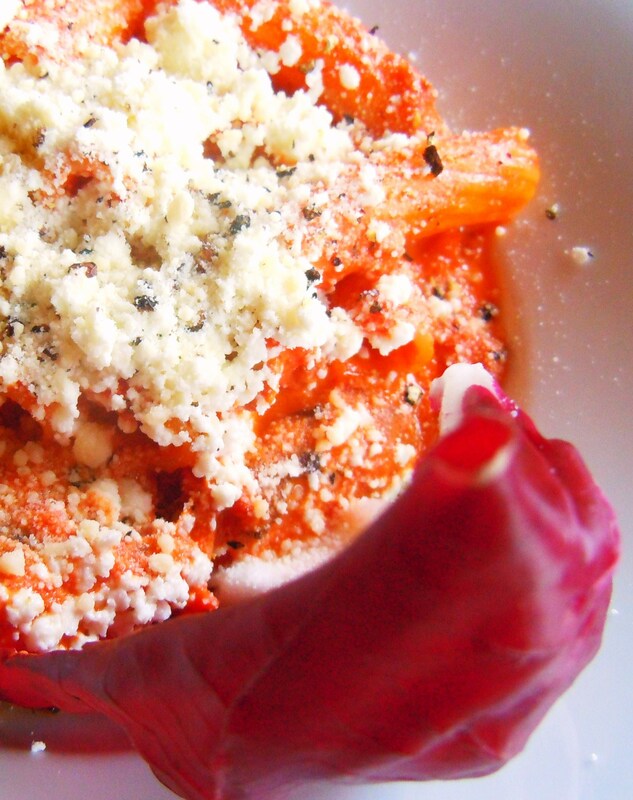 Anyway, I could write a novel on why I love this pasta dish so much. It was so saucy, so creamy and so comforting. And it stays hot! 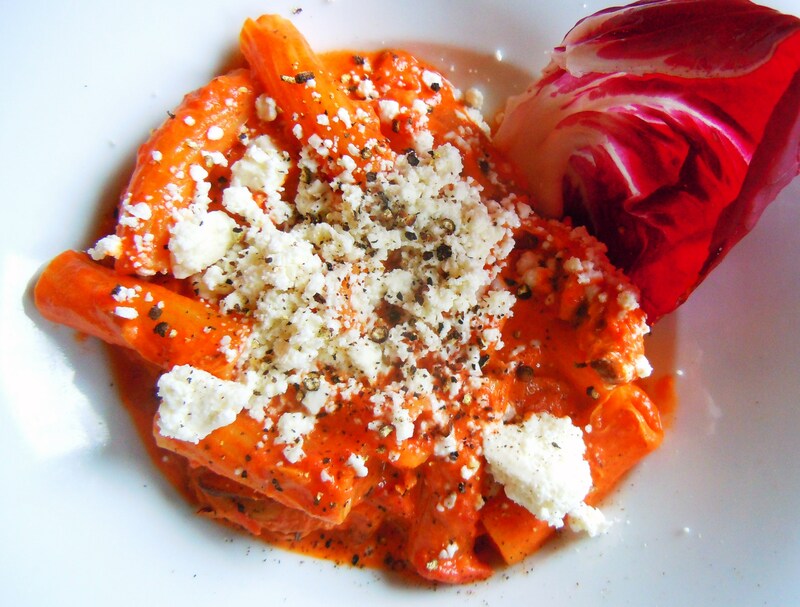 As you dig through it, steam keeps escaping from the bottom up so you’re never left with cold pasta. The sauce is super smooth and savoury, the rigatoni is cooked perfectly, the portobello mushrooms are juicy and meaty and the chicken? Oh my goodness. We’re not talking about plain old strips of chicken. We’re talking smoked chicken that resembles pulled pork. 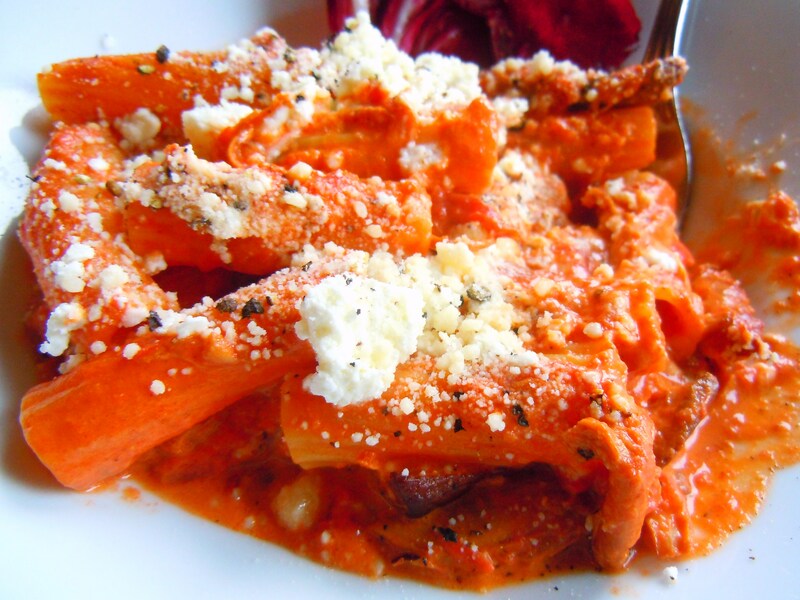 In tomato cream sauce. Surrounded by cracked black pepper and goat cheese. It is HEAVEN. The chicken gets all nice and shredded as you’re eating it so you have this great texture to the dish that you wouldn’t have otherwise if was strips or pieces or even a cutlet. It really plays up the warmth and comfort factor and it is so satisfyingly filling. We might think to ourselves that pasta dishes are easy enough to execute but it’s the little things and attention to detail that makes all the difference. This wouldn’t be the star that it is if the pasta wasn’t cooked right, if the mushrooms were watery, and if the chicken was dry, tough and overcooked, things that could feasibly happen if it wasn’t executed properly. But thankfully for me they got it spot on and I had a lunch to remember on one very memorable day of the year. 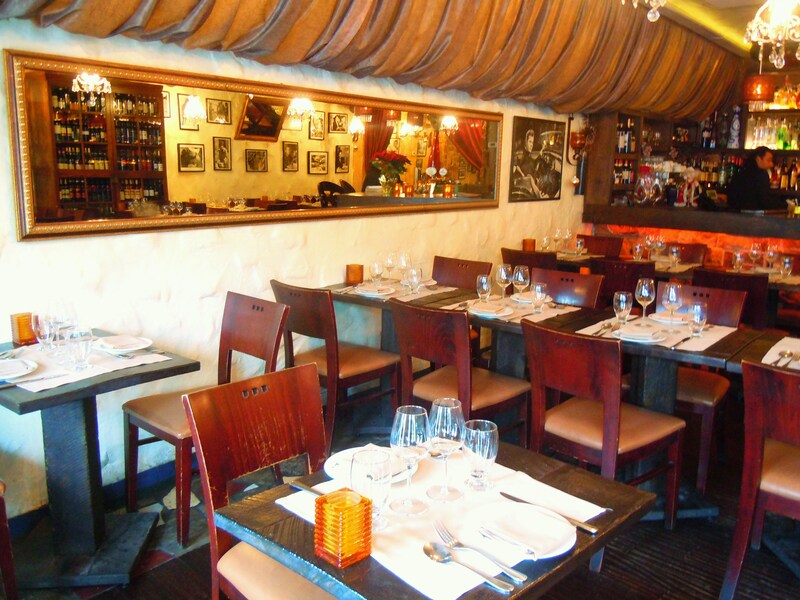 La Vecchia is an Italian eatery that serves lunch, dinner, and weekend brunch (11am lunch Monday-Friday, 10:30am-3:30pm brunch and 3:30pm dinner on Saturday, and 10am-3:30pm brunch and 3:30pm dinner on Sunday). They are located at 2405 Yonge Street on the east side of Yonge Street several blocks north of Eglinton by Broadway Ave. in the Yonge-Eglinton neighbourhood. You can view their menus and contact info on their website HERE. Let Us Eat Cake! 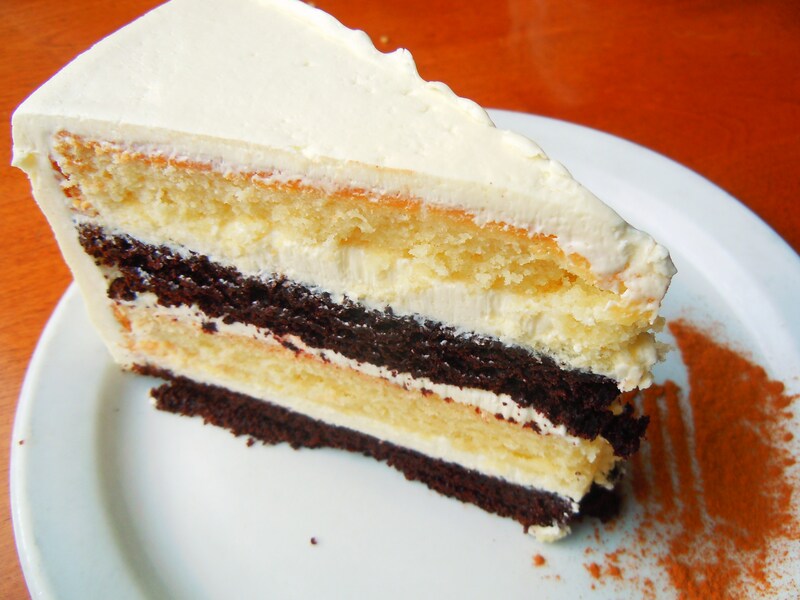 Desserts and Sweet & Delicious Black and White Cake at Queen Mother Cafe! I don’t know about everyone else, but I’m always on the hunt for cafes that have an amazing selection of cake for dessert. YES, CAKE. 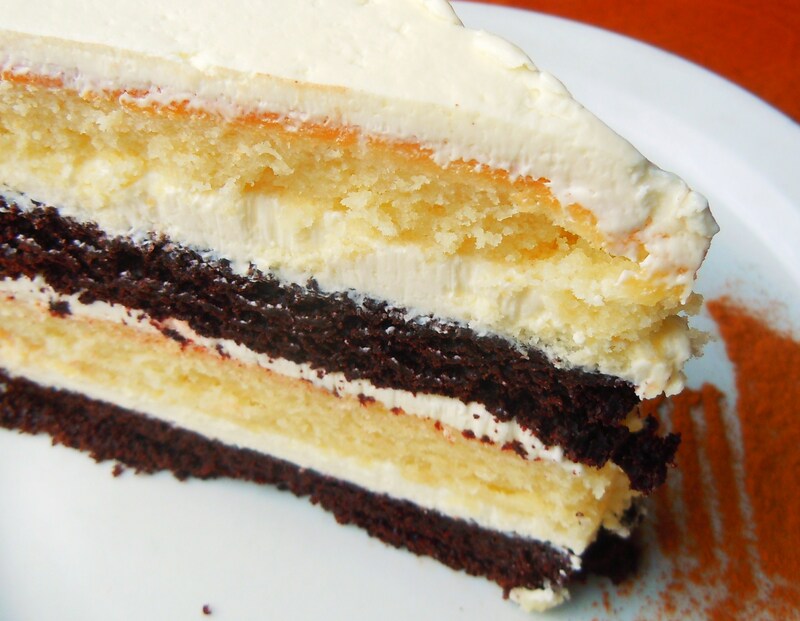 And I don’t mean petit gateaux, I mean a honking delicious slice from a gorgeous giant round cake with layers and layers of moist cake and frosting and all the bells and whistles. I love a fab dessert menu, but there’s nothing like the feeling of being able to walk into a place for a warm drink and a mouthwatering slice of cake without having that awkward, “um, yes, I’d like to order from the dessert menu…and um, nothing else. Thank you!” feeling. Off the top of my head Wanda’s Pie in the Sky (don’t let the name fool you, their cake is amazing! Check out Ate by Ate’s posts on their famous rainbow cake and carrot cake!) in Kensington Market and Futures Bakery in the Annex are perfect places for an awesome slice of cake, especially Futures Bakery if you’re looking for selection! 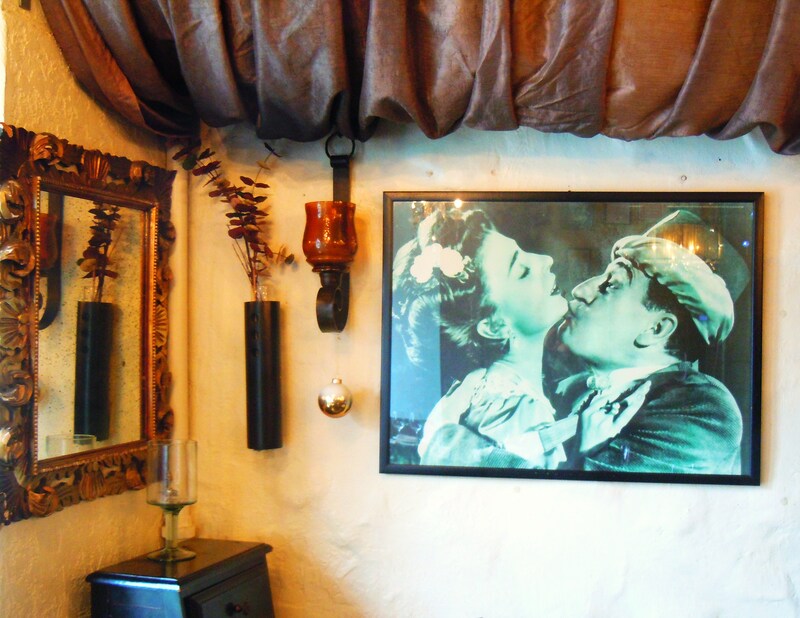 Now we can add Queen Mother Cafe to the mix and I am so incredibly happy about this! Choosing cake and dessert here is like choosing your favourite candy from the candy store: you walk right up to the counter (or in this case, the bar), look through the glass case(s) in delight, and point and say, “that one!” At any given moment Queen Mother Cafe has about 10 different kinds of cake on hand ($5.99 a slice): cheesecakes, tortes and tarts and mile-high layer cakes are all up for grabs. The cafe has several popular La Rocca cakes on hand alongside their beautiful and delicious housemade ones that rotate and change on a regular basis. During my very first visit back in late November, I ordered a slice of one of the most amazing cakes known to sweet tooth: their signature Lemon Escapade, a mountainous combination of lemon cream and frosting, vanilla cake, almonds, and the crunchiest of meringues. It was unlike anything I had ever seen or tasted and I promise you guys I will get photos the next time; I didn’t have enough lighting where I was sitting and couldn’t take any! But if you beat me to Queen Mother Cafe and if you see the Lemon Escapade, YOU MUST HAVE IT, I’M NOT KIDDING! After that first time, I knew having cake at the cafe was an absolute MUST for each and every single visit thereafter and I was not disappointed the second time around. I chose their beautiful black and white velvet layer cake, a 4-layer cake with 2 layers of vanilla and 2 layers of chocolate with sweet cream frosting all over and adorable little edible pearls on the backside (my apologies for the lack of photo on that one! If I get around to having it again I’ll remember to take more!). 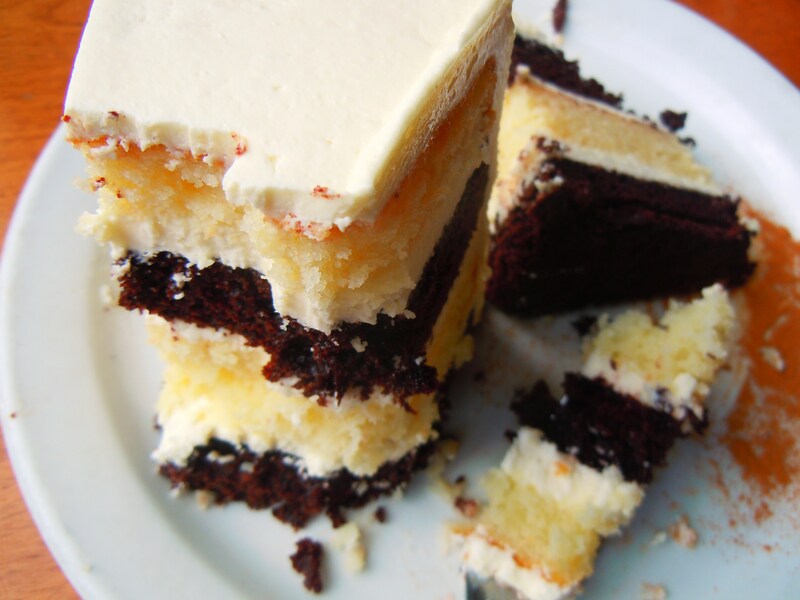 The cake was wonderfully moist and it is just the epitome of what vanilla and chocolate should be. It seems so simplistic but to represent the classic timelessness of vanilla and chocolate in this fashion is no easy feat. I’ve had chocolate cake that’s been too dry and vanilla cake that’s been too artificial and crumbly. 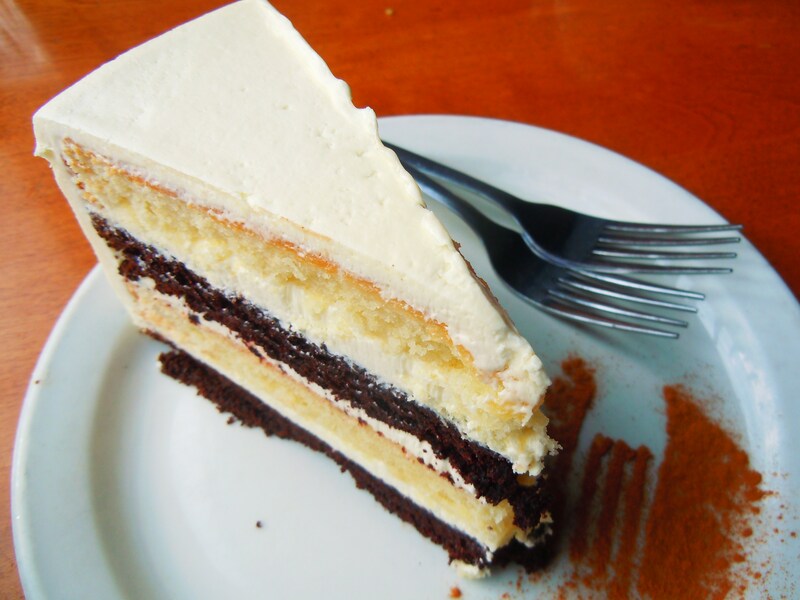 Queen Mother Cafe’s black and white cake nails it and it is truly cloud nine for your tastebuds. Their menu delivers in both savoury and sweet departments and I am beyond excited to go back many more times to come. Queen Mother Cafe is located at 208 Queen Street West in the downtown core just steps away from Osgoode subway station, situated between St. Patrick Street and Duncan Street. They are opened 7 days a week, serving lunch and dinner Monday through Saturday (11:30 am to 1 am) and weekend brunch and dinner on Sundays (11:30 am to midnight 12 am). You can visit their official website HERE to view their info and menu.